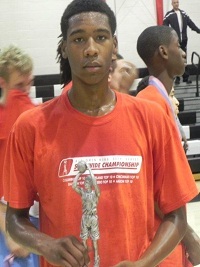 * South Carolina Aiken, Saint Thomas (FL), and Ohio Valley all offered ’13 PF/C Ellis Williams. * Saint Thomas (FL) also offered ’13 SF Matt Gump. * Ohio Valley also offered ’13 SF Brandon Bapst. * Aaron Jackson – Could quite possibly become a high major recruit, with whispers of an ACC inquiry.